A: Check-in is any time after 3 pm. Check-out is 11 am. Sometimes, it may be possible for early check-ins or late check-outs. However, we cannot guarantee them until the day of arrival or check-out. Check-ins before noon or checkouts after 1 pm will require a half-day charge. Q: What is an event weekend? A: Gastehaus Schmidt will charge holiday rates and require two nights on the following weekends in 2014. (The week between Christmas and New Year will charge holiday rates but does not require a two-night minimum, unless the property requires it.) Check out these upcoming Fredericksburg, Texas events! A: Our office is Located at 231 West Main Street. We are between Old German Bakery and Fredericksburg Winery. We are directly across the street from Good Art Company. We are between the cross streets of Orange and Crockett. 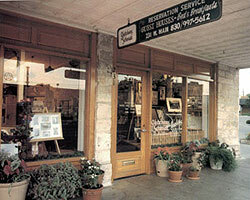 We are between Fredericksburg Winery and German Bakery. A: Our office hours are Monday-Friday 9 am to 6 pm, Saturday 10 am to 5 pm, and Sunday 10 am to 4 pm. Our office is closed on Easter, Thanksgiving, Christmas, and New Year’s Day. We are open from 10 am to 4 pm on other holidays. 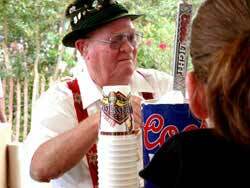 Q: When is Oktoberfest, Food & Wine Fest, or other events?